To affirm the Oneness of Allah – the praised and glorified Creator – in His essence and His attributes. To affirm that Allah alone should be worshipped and that no other being should be worshipped along with Him or instead of Him. To safeguard human welfare and oppose corruption and evil. Thus, everything that safeguards faith, life, reason, wealth and lineage are part of this human welfare that religion protects. On the other hand, anything that endangers these five universal needs is a form of corruption that religion opposes and prohibits. To invite the people to the highest level of virtue, moral values, and noble customs. The ultimate goal of every Divine Message has always been the same: to guide the people to Allah, to make them aware of Him, and to have them worship Him alone. 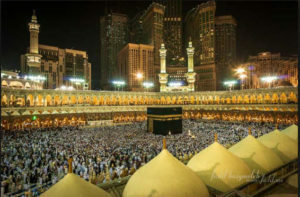 Each Divine Message came to strengthen this meaning, and the following words were repeated on the tongues of all the Messengers: “Worship Allah, you have no Allah other than Him.” This message was conveyed to humanity by prophets and messengers which Allah sent to every nation. All of these messengers came with this same message, the message of Islam. Regardless of their linguistic, cultural, and racial differences, Muslims form one community of believers. This community is based on their shared faith in One Almighty God and the guidance He has sent down to mankind. His final revelation to mankind, the Quran, was sent over 1400 years ago to Mohammad in the Arabic language. Thus, it is the Arabic language that serves as the common link joining this diverse community of believers and is the unifying element that ensures believers share the same ideas. The original Arabic text of the Quran has been preserved from the time of its revelation. Of course, translations have been done into various languages, but all are based on the original Arabic text that has not changed in many centuries. In order to fully understand the magnificent words of their Lord, Muslims make every attempt to learn and understand the rich and poetic Arabic language in its classic form. Since understanding Arabic is so important, most Muslims try to learn at least the basics. And a great many Muslims pursue further study in order to understand the full text of the Quran in its original form. So how does one go about learning Arabic, especially the classic, liturgical form in which the Quran was written?